Thrifty Adventures is a wilderness guiding service based in western North Carolina. TA has the largest variety of experiences you will ever find with any single outdoor adventure company! 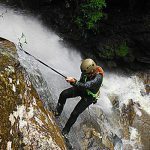 They provide adventures for the novice to more advanced Rock Climbing and Alpine Instruction. Our goal is to provide a safe environment for all who strive to test their limits and explore the world around them. Thrifty Adventures excels in creating fun and informative events. We feel it is important to not only offer people new experiences but to dig deeper and teach them about the preservation and history of these areas!